Disclosure: This is a sponsored post for Spot Shot, and I received product and/or monetary payment for this promotion. All opinions in this article, however, are honest and my own. Is there anything better than a nice, clean house? While I am not someone who enjoys cleaning, I do enjoy the finished product. For me, it is even better in the spring since I can open the windows and enjoy the fresh air. After having such nasty winter weather, it is nice to have the sun shining in my house – even if it is showing all the dust and dog hair everywhere. In other words, my house is letting me know it is the perfect time to reorganize and do some much needed spring cleaning. Of course, having two large dogs that live in the house full time, we have special messes that only dog owners can truly understand. Luckily, we have some amazing tips to make spring cleaning in a pet friendly household even easier! How many of you have dogs that leave their toys everywhere? Since our girls toys were getting a bit out of hand, we started training them how to put their toys away on command. While we aren’t there just yet, we are making some headway and they at least know where you can find their favorite toys. 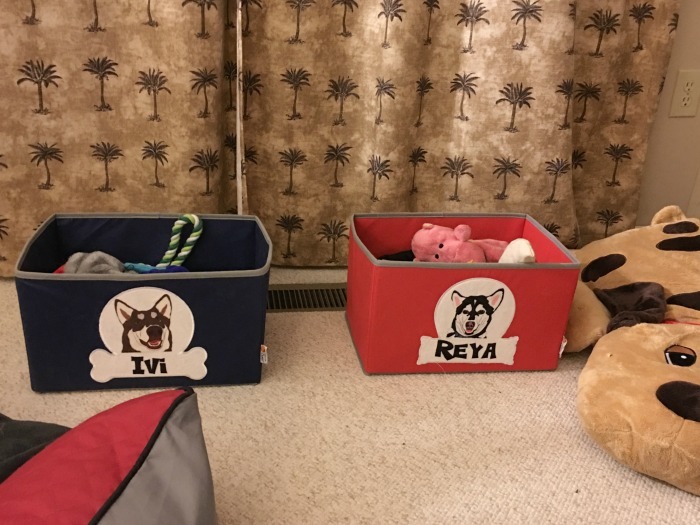 Upstairs, we have a generic basket for their shared toys, but downstairs we have two baskets – one for Reya and one for Ivi. The girls know them by color but we had fun getting custom made ones for them. Even though I adore Reya and Ivi, it is very obvious when they need a bath. Their beds, unfortunately, also hold the smell, as well as their VERY loved soft toys, with dried saliva, hair, and dust. Nearly all pet beds and soft toys can easily be thrown in the washing machine. For the bed, just unzip the top cover and throw that in the machine. The filling itself is sometimes washable, sometimes not, so make sure to look at the care tag before washing anything else on the bed. When washing your dog’s bedding and toys, make sure to use only non-scented detergents since anything else can be too strong for your dog. While I regularly clean the girls’ dishes, it isn’t often that I actually clean the entire dish holder. Most dog items are 100% safe to throw in the dishwasher, especially stainless steel dishes. 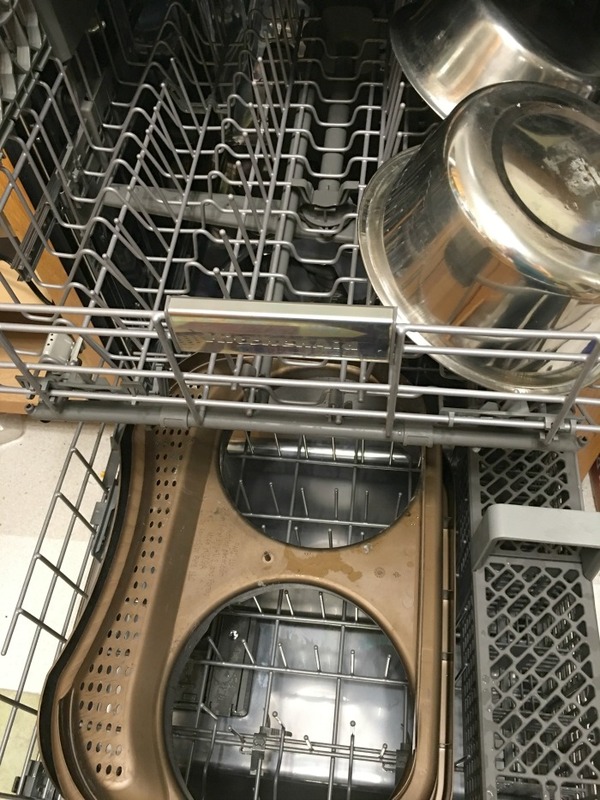 In our house, we run the food dishes on the top rack of the dishwasher with the sanitize function. We then, once a quarter, unless there is an obvious food mess, put the entire Neater Feeder in the dishwasher. Between washes, we regularly wipe it out with an anti-bacterial cleaner. When was the last time you cleaned your dog’s crate? Unless they had an accident or vomited, it is likely one of those things you rarely think about (unless it smells, of course). Rather than go for the bleach, just wipe the crate down with hot, soapy water and dry it thoroughly. If you feel a cleaner is necessary, go with an all natural, anti-bacterial cleaner. 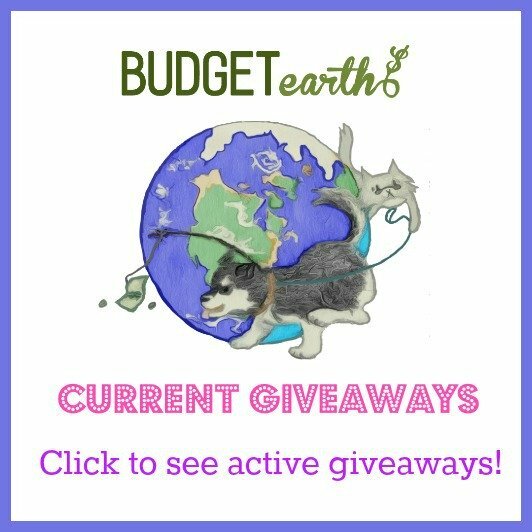 How many times have you looked around your house and found ‘accident’ stains from when your dog was a puppy or had a recent accident you just found? Not only can they smell rather unpleasant, they can make your carpet look rather unappealing, to say the least. For dog related stains including urine, vomit, feces, and even dirt, we use Spot Shot Pet in our household. Not only can this cleaner almost instantly get out these nasty stains, it works just as well on old stains too! Just get up as much of the stain as you can, spray it, and watch it do its magic without much effort at all from you. Best of all, it gets rid of the smells that leave your dog wanting to mark that spot again, protecting your carpet from future accidents. Want to pick up this carpet cleaner for your own home? 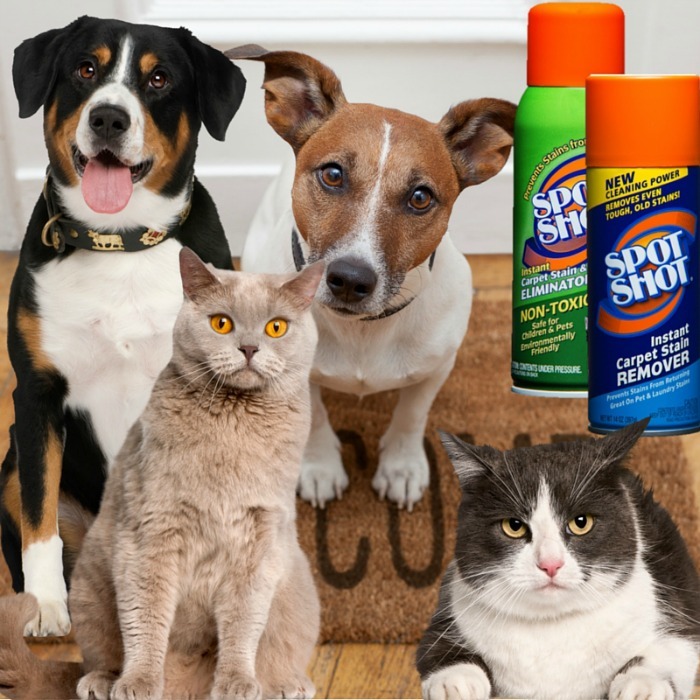 You can currently buy Spot Shot Pet in a 14 oz Aerosol can or 22 oz Pet Trigger, whichever is easier for you. Both of these products have the Seal of Approval from the Carpet and Rug Institute and are SCS certified biodegradable, making them the perfect option for pet friendly households like ours. Currently, you can find Spot Shot and Spot Shot pet at your local Wal-Mart store. To learn more about this carpet cleaner, head over to the Spot Shot website and don’t forget to score yourself a $1 off coupon too! Want to learn more? Join the Stain Fighting Community on Facebook for more tips! I need to clean my dogs crate. I rarely do that. Thanks for the tips! Thank for t info on Spot shot this is what my sister needs with 2 new puppy’s. Our 2 long-haired cats died of old age last year & I can’t get over how much work they made! I had to vacuum every day & clear up hair ball barf! I’m sticking with short-hairs from now on! I use Spot Shot on my microfiber couch, too. Spray, wait, rub it with a damp cloth, let it dry. Voila! That spot is OUT! We like spot shot too. I haven’t heard of Spot Shot before, I will definitely try this. Thanks for posting these tips! Great tips! Thanks so much for sharing. Have a great weekend. I love the personalized toy baskets! I love the idea of having your dogs pick up their toys. My teen teases me that our 4 year old lab has more toys than a toddler…I’m constantly picking up toys! 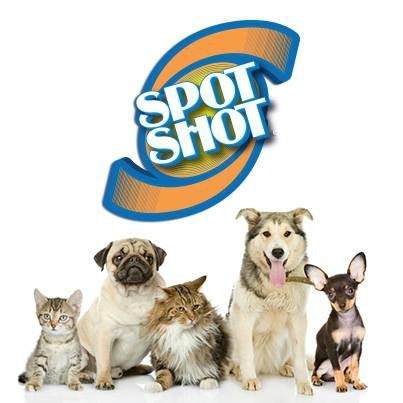 I will have to try out the Spot Shot Pet to get rid of pet stains! My cat has sleeping spots all over, usually on a mat or blanket, which are easy to throw in the washer. However her secret, hidden spot is on a pile of clothes in my closet. I`m not as happy about washing a pile of clothes. Spot Shot is a great product. 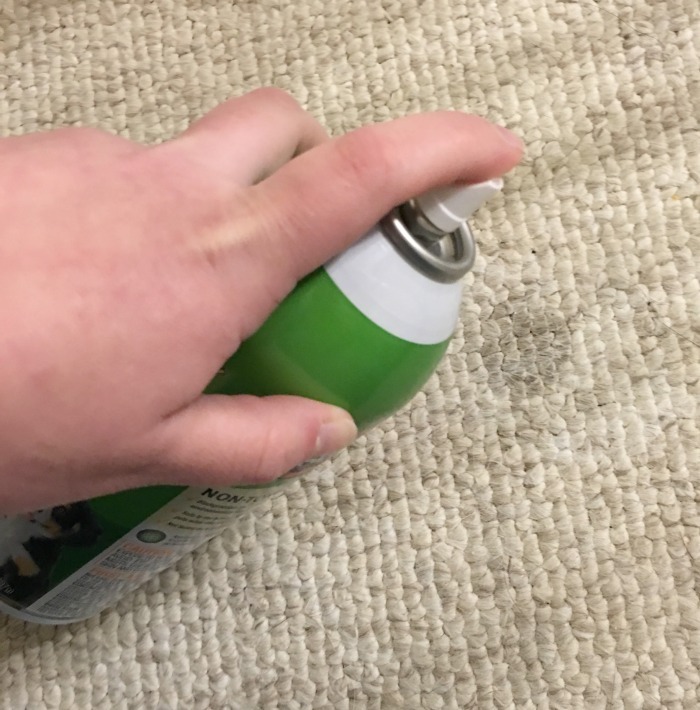 I have used it on carpet spots many times. have 8 cat’s right now 4 that was are’s and 4 that was left after a family friend died.and right now I think they are all trying to shed there winter fur! it’s a little crazy here right now. I have 3 cats and have used Spot Shot before-after reading this I probably should go get some more. I use spot shot a lot. It does a really good job. That just shows me how many things I don’t have to clean since I don’t have pets. Anybody thats got pets has a problem with their messes and smell, thanks for the info. Spot Shot has been a lifesaver! I have 4 kitties and they have left stains on my carpets. I’ll have to try spot shot a try. For crying out loud, I just had to start searching for the Spot Shot cleaner before I got to the bottom of your post, but had I waited and finished the post I would have saw your direct link. Anyway, thanks for the info. I will definitely be getting some of the cleaner. I like that shot spot we have had rugs ruined because our pets have accidents on them and I like the bins for pet stuff. Half the time can’t find all of my dogs toys and things. Thanks for sharing would never think to try that one without some advice. Glad I don’t need these tips. Gosh, I needed the ideas on the pet toys. Poor little Walter loves his toys and has one in his mouth all the time. Hi! thanks for the tips, I have a little dog, is my life, she sleep with me and obviously I need all clean! Sounds like spot shot works great! If I ever get pets again I would definitely use it. These are some great ways to handle cleaning for my special friend. I thank you so much for the help. I don’t have dogs but my daughter does and these are great tips to pass onto her. I clean everything, our little Dauchy brings me his favorite toy from other room when I start cleaning his toy box toys. I wash his pillowcases and bowls and like I do our things. He lives with us and I want him and his things clean just like I like ours. Thanks for sharing your tips, I need to try the carpet cleaner even though I make more spots than he does. We live in a red dirt area and he loves exploring in the woods so he does get a little on the floors even after crossing the 2 mat phase of coming in – lol. We also toss and get new replacements for toys once they become old or break/split all the good things that happen when he plays tug of war with us. He won’t give in to my husband he has to really pull to get it and sometimes his sharp teeth spit a fabric toy – our dog, not my husband- lol. Good tips and reminder to get it all cleaned. Thanks for sharing. Great tips to follow! I have a cat who loves to bring branches in from the outsides. Yes, I said branches, not twigs. I think he’s a dog in disguise. The branches are all over the house. It’s an endless feat! Thanks for sharing these great tips. I have used Spot Shot and it’s awesome.